My students who are disengaged from this style of instruction were disengaged during all previous instructional strategies. Several of my students who were previously disengaged from the learning are becoming engaged and, while they complain about taking notes, do so VERY well and ask clarifying questions. 1) My students who are traditionally low-achieving are starting to thrive. The more organized and chunked fashion in which we are covering material is helping to keep them on task and not overwhelmed. 2) Several of my more disruptive students are becoming less so because, instead of chatting with their friends, they are first making sure they have the notes copied. They also seem to be interested in being the first ones to answer questions and making them write everything down is giving good wait time to the students who don't process as quickly. I am keeping myself amused through the cunning use of laser pointers on my wall-grid and color coding the notes. I used several pieces of painters' tape and asked the students to determine the slopes of the lines. I had them do it silently for 90 seconds, then turn to their groups and compare answers for 30 seconds. Then we went over it as a class. I was very pleased with their engagement and work and, as much as I hate direct instruction, I'll do what works for my students. Again, I'm hoping that I can use this success and engagement to move towards more authentic tasks in the near future. Tomorrow, I hope to have them measure the ramps in the school for ADA compliance. As geometry started, one of my students asked if I had another "hard problem that would take the whole class." As it so happened, I had just received a message from +Megan Schmidt with a math question. The sides of the square are 20. 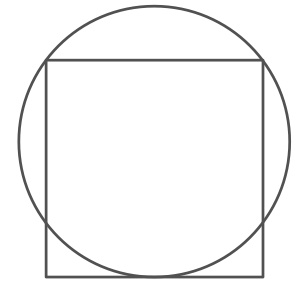 What is the diameter of the circle? I handed it to the young woman and started going over the guided notes with the rest of the class. During breaks and down times, I kept checking in with her and the 2 or 3 others who were working on it. I watched them work through their frustrations and dead ends, going to the text for information that they knew we hadn't covered yet. Mr. Aion had told me today was going to be a boring day, definitely not my style. So I asked for another problem and the lovely Megan Schmidt had given up a problem that looked very simple. 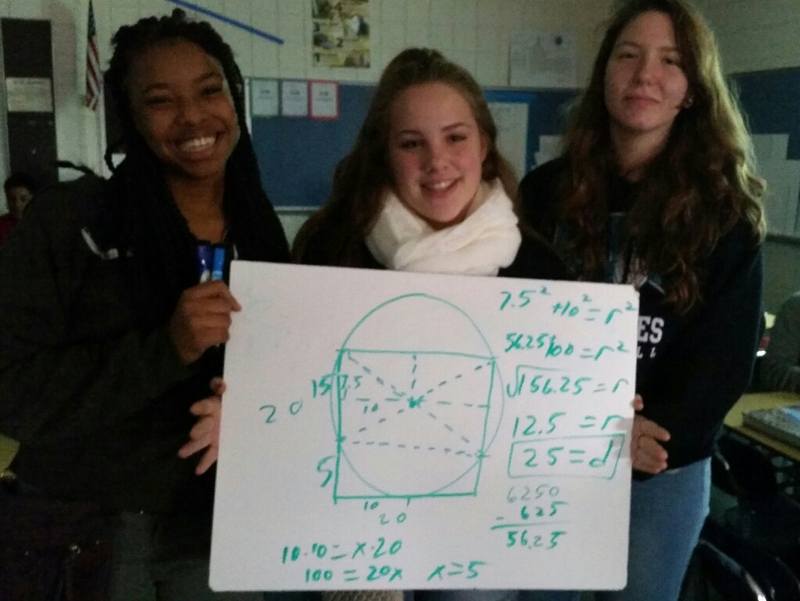 Once Caitlin, Amani, and I had started to work on the problem we were very lost. Had no idea where to start, and that's when Mr. Aion came in. He got our brains to start working. He suggested some things that may or may not help us figure out the problem. Coming closer to the end of the class we sat there frustratedly flipping through book pages, we hadn't learned any of this before. Mr. Aion came over once again to check on us. I was very annoyed at that point, but being the stubborn teenage girl I am I refused to give up. That's when it hit us, we were going in the right direction. I was so happy, and relieved. I was proud also, and so were my classmates. I am so glad to have such amazing friends and such an amazing geometry teacher. I am so impressed with them but, more importantly, they were proud of themselves. If we can find a way to give students agency and excitement over their education, there is no way we can fail. Great post Justin. You're rocking it! I have some pretty great kids. What are you doing to evaluate their note taking? I'm thinking (and have been for a while) about doing something similar and Cornell notes is the choice of the school, but I really hate micromanaging. I don't want to do notebook checks; I hate grading for homework as it is. I completely agree with you about micromanagement and grading homework. I'm not grading the notebooks. I'm strongly encouraging it, but there won't be any grades associated with it.